3. A dark liquid will collect on the top of your starter this is called the hooch. It is good. You just mix it in. 4. Keep in a warm place about 70-80 °F. 5. Thick starter seems to develop more flavor but a thick starter is difficult for new bakers to work with. A pancake batter consistency is good. 6. When you use wild yeast (yeast from the flour and the air) it might take a few tries before you get the flavor you like. 7. If your starter starts to smell really bad feed it twice a day instead of once or empty most of the starter out feed it and put it in the refrigerator for a day. 8. The starter is ready to use after about 4 days on the counter. It should have lots of bubbles. 9. When using wild yeast for your starter, it will take the bread a lot longer to rise. It might take about 8 hours for your bread to double in size. So it is good to let it rise over night and bake in the morning. 11. bacteria provides the flavor. 12. Sweetners in your starter encourage mold. 13. You can dehydrate your starter to give to friends. 14. Starter left in the refrigerator will stay active for 4 weeks. 15. Many commercial bakeries use a combination of a starter plus packaged yeast which is more reliable and whose growth rate can be controlled. 16. 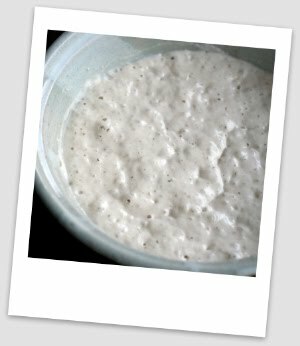 Starter made with commercial yeast have a less distinctive sourdough flavor. 17. Feed your starter once for 3 to 4 days until there are a lot of bubbles and then use or store in the refrigerator. 18. If your starter has been in the refrigerator for a while. You need to refresh it before you use it. Refresh it by adding 1 c. flour and 1 cup water. Do it the night before you want to use it so it comes to room temperature and becomes bubbly. 19. All dough contains at least some bacteria. Why then aren’t all breads sour? In dough made by commercial yeast the yeast outnumber the bacteria. Since both compete for the same sugars, the yeast win out, and the bacteria don’t have a chance to produce their acidic by-products. In sour dough, yeast and bacteria are more closely balanced, so the bacteria have a chance to add their flavor to the bread.